A few years of work to make this student housing project a reality at 2525 Pembina Hwy across from University of Manitoba! Very pleased to be working with the team at Campus Suites to bring this complex to life! The is a high level artistic image of what will ultimately develop into an iconic piece of architecture! An unprecedented student housing development is coming to the city and could help cut the number of illegal rooming houses that have popped up in neighbourhoods around the University of Manitoba. 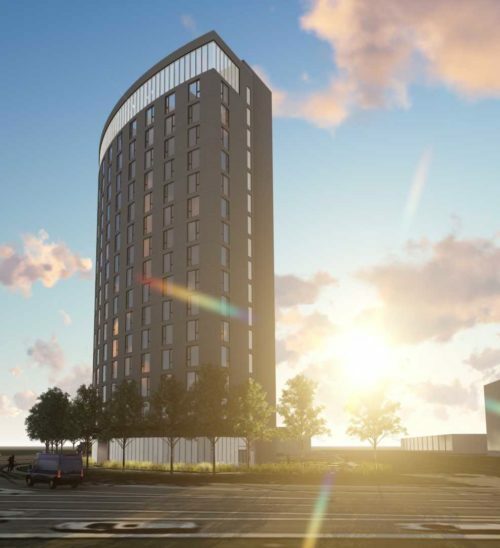 A 16-storey student apartment complex is set for the corner of Bison Drive and Pembina Highway as early as September 2020. Located on the 2500 block of Pembina Highway, the building will be the first of its kind in the city, with 352 units, 513 beds and parking stalls for 176 vehicles and 256 bicycles. “It’s on what we think is one of the pre-eminent corners in the market. We think it’s going to be a transformative building. We think it’ll change the way that area is perceived,” said Henry Morton, co-owner of Campus Suites, the project’s developer. Morton, originally from Winnipeg, says his company has developed and managed mixed-use student-housing projects across the country, having done work in Montreal, Toronto, Ottawa and Calgary. The project has been in the works since the summer and was recently approved by the city’s Riel community committee. Shovels should be in the ground by June or July, with the apartment complex ready for students by the start of the 2020 school year. “It will be designed for the students and their lifestyle. It’ll have fully furnished accommodations, everything from fitness to gaming rooms to communal kitchens — even though we’ll have kitchens or kitchenettes in every unit,” Morton said. The approval of this project is just the latest in a flurry activity from the Riel community committee, which in the span of a week approved two projects, totalling 765 units, set to be constructed near the University of Manitoba. In addition to the Campus Suites project, a 410-unit, mixed-use, development on the 3,000 block of Pembina Highway was also recently given the green light. The Campus Suites development is the latest in a series of projects supported by Coun. Janice Lukes (South Winnipeg-St. Norbert) in her efforts to crack down on illegal rooming houses near the U of M.
In August, the councillor sponsored a study that found there could be as many as 150 illegal rooming houses near campus, which often leave students living in dangerous, cramped conditions. One of the contributing factors to the problematic situation, according to Lukes, is the lack of on-campus housing available to students. Lukes hopes that this development will have a significant, tangible impact on the situation, given that the complex will not only be specifically geared towards students, but is also being built only a stone’s throw away from the U of M campus. “This building will be a game changer for the neighbourhood in so many ways. It will definitely alleviate the pressure on rental housing. It is close for students. The developer is offering a product that ensures the transportation choices are sustainable,” Lukes said. Morton spoke highly of the councillor’s help in their efforts to try to get the project off the ground. “I respect the involvement of Coun. Lukes. There’s been a collaborative series of discussions with her. She understands what our mission is and what we’re trying to get a accomplished, in terms of the benefits for the community and the transformative nature of what we’re trying to do,” Morton said.